﻿﻿﻿﻿﻿﻿﻿﻿Fund has raised $60 million in 10 years for hatcheries and stocking. ﻿﻿﻿﻿﻿﻿﻿Ten years ago, Texas freshwater anglers were asked to pitch in and help revamp an aging fish hatchery system. Since Sept. 1, 2004, those who have bought a license to fish our lakes and rivers have paid an extra $5 per year for a freshwater stamp. Authorized by the Texas Legislature in 2003, the stamp created a dedicated fund to repair, maintain, renovate or replace freshwater hatcheries and to buy game fish to stock in public waters. In 10 years, that $5 fee has generated close to $60 million. So what has the Texas Parks and Wildlife Department done with this money? The biggest share went to design and build the John D. Parker East Texas Fish Hatchery, which produced its first crops of bass and catfish in 2012. Situated just below Sam Rayburn Reservoir, the facility replaced the Jasper Fish Hatchery, built by the Civilian Conservation Corps in 1932. The total price tag to construct the hatchery and its associated infrastructure was $43 million, with about $38 million provided by the freshwater stamp. Back around 2000, when TPWD began talking with angler groups to gauge public support for a possible freshwater stamp, “our highest priority was to replace Jasper,” recalls Gary Saul, who recently retired as TPWD Inland Fisheries director. Engineering studies indicated some existing hatcheries could be renovated in place. At Jasper, faced with leaky earthen ponds, an insufficient water supply and virtually no indoor spawning facilities, TPWD decided it was best to start fresh. The new East Texas hatchery has 67 acres of rearing ponds and a 34,000-square-foot production building where fish are spawned and their eggs are fertilized and hatched. Temperature and water-quality controls are state-of-the-art. Outdoor ponds are equipped with modern liners and a new type of “kettle” (the outlet and holding structure at the downstream end of the pond) that allows more efficient harvest and loading of fish. In 2014, this hatchery produced and stocked 4.26 million fingerlings into Texas waters. Renovations and repairs at other hatcheries have accounted for approximately $5 million of the fund so far, with some projects still underway. The stamp paid for pond liners at the Possum Kingdom and A.E. Wood (San Marcos) hatcheries. It’s helping to upgrade wastewater treatment at A.E. Wood and build a holding facility at Possum Kingdom where striped bass broodfish can live year-round. 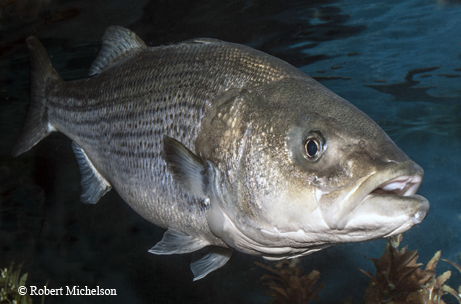 These captive fish serve as a backup source of eggs for TPWD’s annual production of striped and hybrid striped bass. In some cases, TPWD has been able to stretch stamp dollars by using them as matching funds for federal grants. The stamp provides a reliable funding stream for basic repairs and maintenance — work that isn’t glamorous but needs to be done. Like a city public works department, a fish hatchery has roads and driveways, water pumps, pipes and valves, and electrical systems that control critical functions. “If you don’t maintain that infrastructure, it decays and becomes dysfunctional,” notes hatchery chief Todd Engeling. Another $1.5 million has been used to buy fish, mostly rainbow trout for TPWD’s popular winter stocking program. TPWD stocks more than 100 small lakes and rivers with trout each year. Prior to 2004, that effort was funded by an optional $7 trout stamp, which no longer exists. Today all freshwater anglers buy the $5 stamp, and some of that money pays for trout. The freshwater stamp has also given TPWD the flexibility to address emerging issues. Fish kills from golden alga blooms were just starting to be a problem at the beginning of the last decade. In 2001, a bloom on Diversion Lake wiped out a season’s hatch of striper fry at the Dundee State Fish Hatchery near Wichita Falls. Scientists still don’t know how to control golden alga in lakes and rivers, but they can keep it out of hatchery ponds by treating incoming water with ozone gas. Ozone systems don’t come cheap, but with stamp funding, TPWD is installing them at vulnerable hatcheries. The ongoing drought has also caused hardships at some hatcheries. Diversion Lake was hit hard and hasn’t recovered yet, putting the Dundee hatchery out of production since 2012. Water isn’t usually a problem in East Texas, but in 2011, Lake Athens dropped so low that the pipe supplying the ponds and tanks at the Texas Freshwater Fisheries Center was above water. TFFC is now building a storage reservoir to provide a short-term emergency supply if that happens again, along with a system that can treat and recirculate hatchery water if necessary. TPWD is looking at similar strategies for all Texas hatcheries.